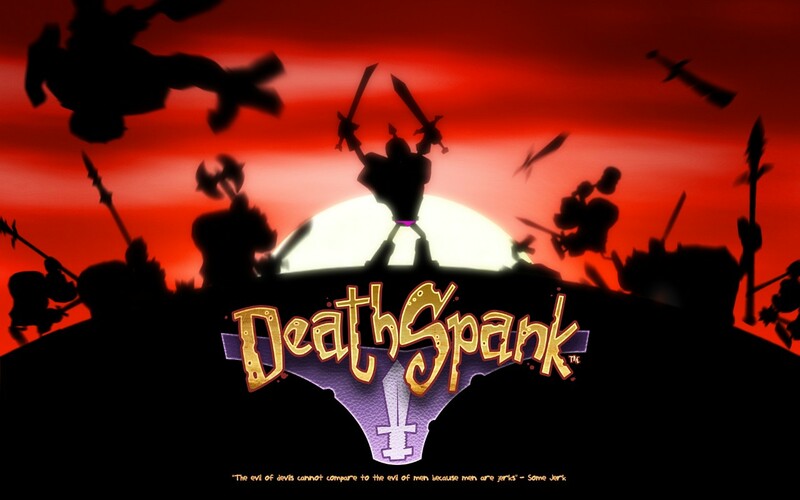 DeathSpank is a comedy role playing game that was created by Ron Gilbert (who along with Tim Schafer created the fantastic Monkey Island series). 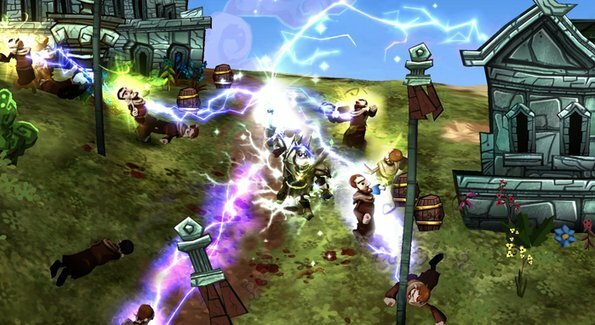 The game is a fantasy RPG which casts you as a hero named DeathSpank. DeathSpank was told long ago that it was his destiny to get a special artifact known only as 'The Artifact'. Due to this knowledge DeathSpank dedicated his life to becoming the best hero possible. The game starts with DeathSpank finally near the end of his quest to locate this fabled item. Along the way you incur the wrath of Lord Von Prong, a man who commands an Orque army (Orques are basically Orcs). 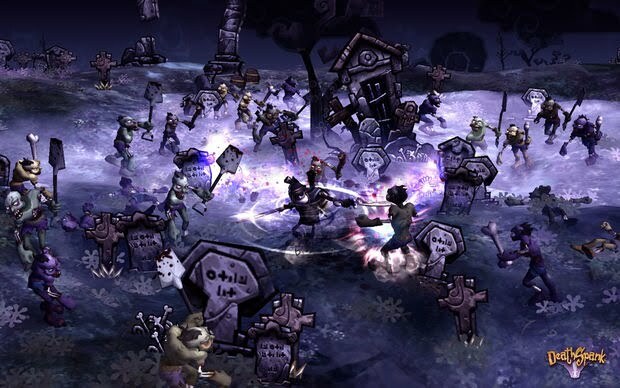 The game has been described as a cross between Monkey Island and Diablo. I agree with this. DeathSpank can be equipped with up to four different weapons, each mapped to a different button. Combining weapons leads to combos that increase the damage you do. Combat is real time with you hacking and slashing your way through the various monsters of the fantasy land you find yourself in. You have a power meter which charges with each hit you land, when it is charged you can do a powerful one off attack. The best way to get the move charged is by clever use of the block button. The game takes place over a moderately large world encompassing locations such as towns, swamps, caves, lakes, and woodland. The locations are diverse, but never feel totally separate from each other. To help you get around the world there are outhouses that can be used to warp around. 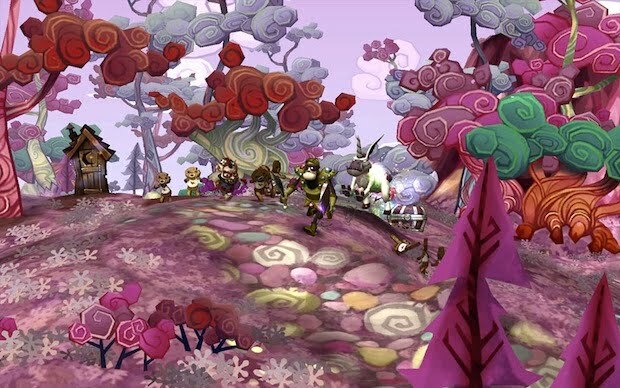 The world looks beautiful, and cartoony, from the saccharine pink fields of the enchanted forest to the dark, gloomy sea of bones in the haunted forest it all looks great. Structures such as buildings and trees are all displayed as 2-D and flat which is a method that gives the world a unique feeling. The game is mission based, people with exclamation marks over their heads give you missions that range from killing a certain amount of enemies to collecting a specific object from the game world. There are over a hundred quests to do, and each has a lengthy dialogue sequence to start it. The dialogue in this game is funny. DeathSpank comes across as quite an idiot, albeit a powerful heroic idiot. A lot of the comedy comes from his stupidity as he misunderstands what people are saying. The characters for the most part are not that exciting, being nothing special, but the lengthy multiple choice Monkey Island style dialogue scenes are many, and help break up the game. I frequently laughed out loud at these. The main enemy type for the main part are Orques. Later on in the game there are zombie Orques, but I really did not notice much difference in these. Various monsters and animals make up the rest of the enemies. There are unicorns, demons, as well as spliced up mishmashes of animals such as a kangaroo crossed with a cow. The horror themed haunted woods sees the arrival of flying flaming skulls, as well as plenty of skeletons, and ghouls that haunt the graveyard level. There are a few bosses in the game, but none that are memorable. I have done a sterling job yet again of making a fun game sound really boring! It is really really addictive, the mission structure reminded me of Borderlands. There are many many items with which to equip your character, and these visibly alter DeathSpanks appearance. The game took me over ten hours to do, a decent length for its 1200 Microsoft points cost. Give it a try and you will be sucked in, highly addictive, and quite funny.